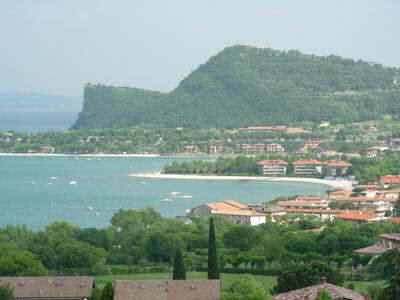 "Manerba is an area consisting of several villages located around the Rocca di Manerba"
The "Rocca di Manerba" is a high rock which climbs dramatically towards the lake and then fall sharply off into Lake Garda. It is clearly seen when approaching from the north side and is a well known land mark in the area. Around this area are several villages, mainly located slightly inland, which form Manerba. Some of these villages are small and windy. When we first stayed in this area, the place we were at was down a very narrow road! We really liked it though, and it was nice to eat out in the small village pub where you were amongst the locals instead of tourists. Gardoncino, where we stayed, was also close enough to wander down to the lakeside in only 10 minutes. We discovered a lovely little port and beach at Dusano, where you could get a limited ferry service from. That is the thing about the Lake Garda area: There are so many surprises around the corner, and often if you explore away from the most touristy areas, you can make some excellent finds. Just don't be in a hurry, and enjoy yourself, as the roads can often be very narrow and twisty. 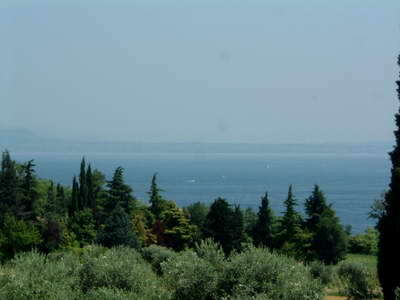 We found this area had a nice view over the Lake to Garda, and was also handy to get to either Salo or Desenzano. 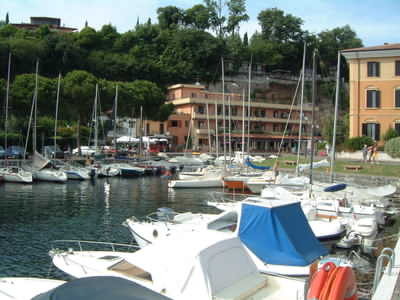 It is full of character, and while the area may not have the impressive lakeside promenades or shops of some other towns, you can still enjoy the small villages and hills around here. 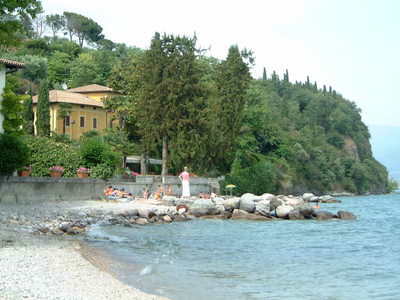 Some nice beaches can be found in the area and you are, of course, never far from another nice restaurant, wherever you are on Lake Garda! Click here to go from Manerba to the home page.